Twitpic anti-social network pattern? | Flickr - Photo Sharing! This is really starting to bug me. SRSLY. According to Tantek this is an example of "Anti-social network pattern" and is supposed to be "bad". 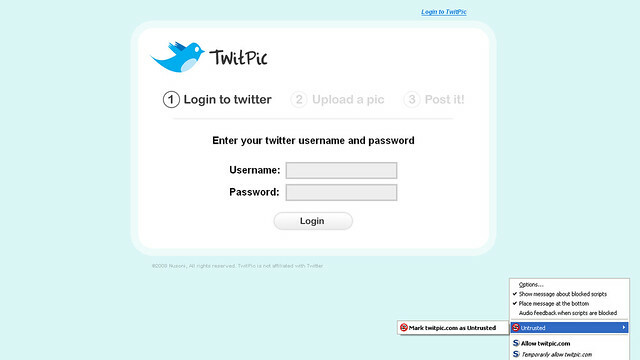 So is it "worse" when one website ( Twitpic ) is asking for your username and password to another website ( Twitter ) that is already "phishing" for your Gmail username and password? Is this "bad" practice accumulative? Please feel free to add more examples to that wiki page, and go ahead and remove the person tags for me and Chris. @factoryjoe I'm just a lowly end user, but having you and Tantek comment on this carries a lot weight. I do have a "friend of a friend" who works at Twitter and I will see if he responds to an email...err "e-FAIL". What about one of those "e-patitions"? Do those ever work?